If you have been eating healthier, following Canada’s Food Guide for meals and snacks, and adding physical activity to your daily routine, congratulations on choosing a healthier lifestyle! Take the next step and evaluate your success by measuring your waist instead of stepping on the bathroom scale. Initially, your weight may not decrease with the introduction of exercise (even though your clothes will be fitting better!). This can be very discouraging and interfere with your ongoing success. Muscle tissue is denser than fat – this means that there are more muscle cells than there are fat cells in the same volume of either. Although five pounds of muscle weighs the same as five pounds of fat, five pounds of muscle takes up less space because the muscle cells are more tightly packed. Imagine, if you change five pounds of fat to five pounds of muscle, then you will look, and feel, slimmer. In addition, muscle cells burn calories more efficiently than fat cells and as your muscle mass increases, so will your metabolic rate. Be patient and in time, you will notice a difference on the scale! Your waist measurement WILL improve if you are following Canada’s Food Guide and have added regular physical activity to your daily routine. Waist circumference is a strong predictor of your risk of diabetes and cardiovascular disease. In the past, the risk of chronic diseases such as these has been measured by calculating Body Mass Index (BMI) and by using blood and other tests. Now, physicians can also use your waist measurement to monitor your risk. 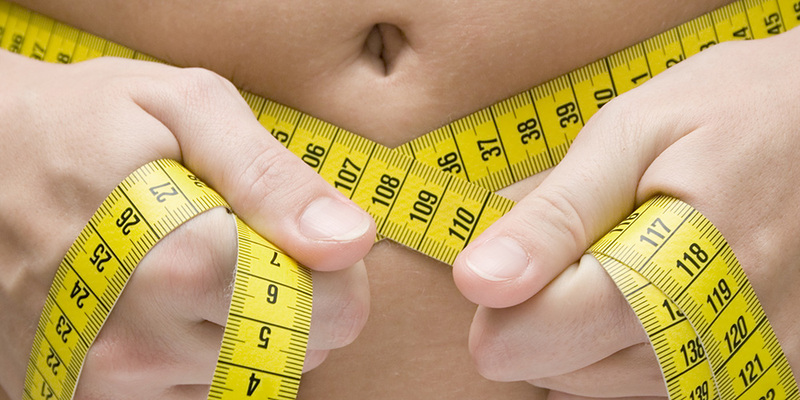 To take a proper waist measurement, clear your abdominal area of clothing. Stand upright with your feet a shoulder’s width apart, facing a mirror. Locate the top of your hipbones and align the bottom edge of the measuring tape with the top of your hipbones on both sides of your body. Make sure the tape is parallel to the floor and not twisted. Relax and take two normal breaths. After you let the second breath out, tighten the tape around your waist. The tape should fit snuggly around the waist without depressing the skin (keep your stomach relaxed at this point). Still breathing normally, observe the measurement on the tape. Target waist measurements for men should be no more than 40 inches, or 102 cm, and for women, 35 inches, or 88 cm. If you fall outside of the targets, you can make changes to improve the numbers. Please speak with your healthcare provider. Losing excess weight may make you feel better about the progress of your diet, but reducing the size of your waist may reduce your risk of some chronic diseases!